The ZTE Solar Z795G is an expansive 4.5-inch budget smartphone that comes with the Android 4.1 Jelly Bean operating system. Additionally, it comes with a 5-megapixel camera together with microSD card slot for memory expansion. The ZTE Solar Z795G is a GSM phone that will be activated on the AT&T network, so you need to check that you have AT&T coverage/cell towers in your home area before ordering. The ZTE Solar Z795G is one of the prepaid smartphones that you can get from Straight Talk. In the box, you get the ZTE Solar Z795G, an AC Adapter, battery, an activation card, a standard USB cable, service guide and a quick setup guide in case you need to look up something. 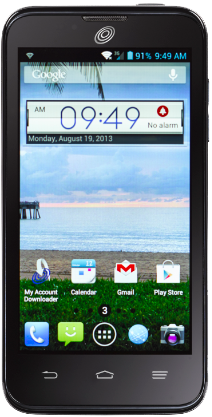 The ZTE Solar Z795G is a 4.5-inch compact device. This means that it’s small enough for one handed operation but still large enough to see everything quite clearly. It measures 4.5 inches diagonally, 5.23 inches in height and 2.3 inches in width, 0.42 inches thick and about 5.55 ounces heavy. The ZTE Solar Z795G is similar in design to other phones from ZTE. On the front below the screen, there is the traditional three backlit navigation buttons with capacitive touch capabilities. The phone has an ambient light sensor, meaning they only light up when it is dark or when there is minimal light. The arrangement is such that; the home button is at the center, the recent apps button/options button on the right and finally, the back navigation button sits on the left. On the left edge, we have the charging port and on the right the volume rockers. 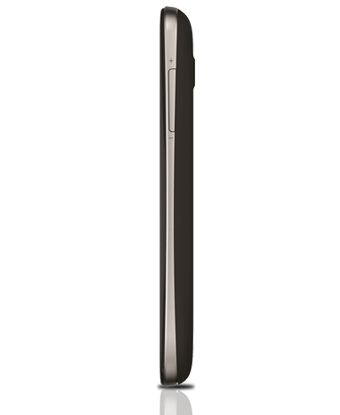 On the top edge, the ZTE Solar Z795G has the 3.5mm headphone jack and the power/lock button. The whole phone is made of plastic although it has a chrome looking trim on it that gives it a high-end feel. The backside battery cover has a rubberized texture which makes the grip easier and feels nice in the palm. The front side of the device features the 4.5-inch screen, an earpiece together with the mouthpiece. However, it's important to note that this model doesn’t have a front-facing camera. The back cover of the phone is removable revealing the battery, microSD slot, and the SIM tray. The ZTE Solar Z795G features a 5MP rear camera with a LED flash. This flash is quite bright thus producing nice photos in low light environments. This being a budget phone, some camera features may be compromised to fit within the price range, but it still does a nice job. In places with adequate light, the camera produces some decent photos. While testing out its autofocus capabilities, I was a bit surprised by its efficiency given its price. Although not matching with its high-end brothers it was quite okay. In terms of video recording, the ZTE Solar Z795G does a pretty decent job. With a 2592 x 1944 pixels video recording feature, you can expect the shooting to be of average quality. I found that it was best to do the filming where there was plenty of natural light for best results. This phone has a 4.5 inches screen with an 854 x 480 resolution. Within the lower end tier, I found the ZTE Solar Z795G amongst to be amongst those phones with a considerably large display. Most phones in this price line have up to 4-inches screen. It’s even interesting that Straight Talk is offering the phone for free with the purchase of a wireless plan (more on this later). The phone has good graphics so watching a video is not stressful at all. Due to the screen size, you can comfortably touch multiple points of the screen without a problem. I found that aspects such as texting are much easier given the display size. This phone comes with a Lithium-Ion 2070 mAh battery that can support up to 9 days of standby time and up to 5 hours of talk time. Given the screen size, there won’t be much of a strain on the battery. An average user can get a full day out of it. Super users, on the other hand, can expect about 5 hours from the device. With massive streaming or gaming, you can expect the battery to last shorter than normal since internet services and graphics drain the battery faster. This device comes with an internal storage of 4GB and an additional 4GB external microSD card provided. I found this to be quite generous given that this is a budget phone. Even though a 4GB microSD card is provided, it doesn’t mean it ends there. 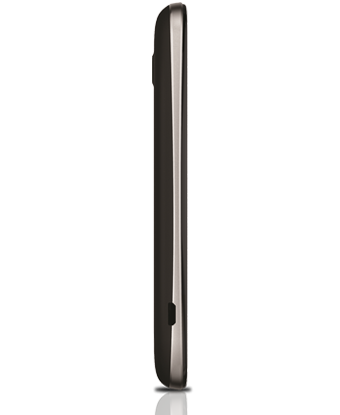 The microSD slot supports a capacity of up to 32GB. So, you can get a larger capacity memory card and replace the 4GB whenever you feel you need more space. ZTE decided to give this device a Qualcomm Snapdragon S4 MSM8625 dual-core chip which packs 1.2GHz of processing speed and 768MB of RAM memory. To aid with graphic intensive games and apps, ZTE equipped the phone with an Adreno 203 GPU which clocks 245MHz. It also comes running Android 4.1 Jelly Bean which supports all the necessary apps to ensure you remain connected. Performance wise, the ZTE Solar Z795G is an average device and I didn’t find any issues with it. I tried out a couple of games on the phone, and it was all smooth sailing. The more graphic intensive ones, on the other hand, were slightly laggy but it is to be expected for a device of this range. Other features on the ZTE Solar Z795G include Bluetooth and Wi-Fi. Battery capacity: 2070mAh. Talk time up to 5 hours. Standby time up to 9 days. Internal storage 4GB. 4GB microSD Card provided. Supports external storage up to 32GB.